One week done and more than a quarter ton gone. 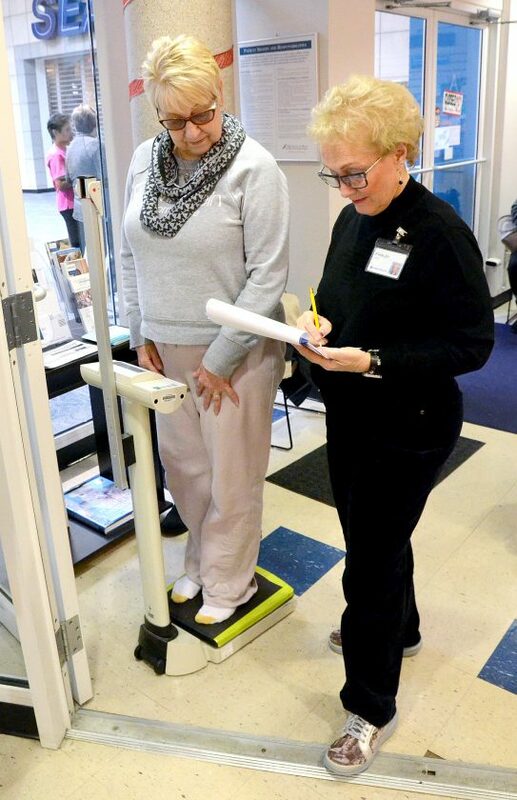 After one week of the 2019 Tribune Chronicle / Mercy Health Fitness Challenge, the 120 players tumbled off the scales 634 pounds lighter. That’s a full load of flubber flattened. A total 2.32 percent of our starting weight burdens us no more. The Dynamo division was dominated by Just Weight, a team comprised of three players from last year’s champions, with 5.26 percent of their starting weight lost. It gave them a big lead over second-place team Thinning the Herd at 4.37 percent and the Slimsons at 4.26 percent. Mission Slimpossible jumped to the early lead in the Go-Getters division, shedding 3.95 percent of their starting weight. The Big Dogs trail at 3.56 percent, with Arianna’s Hope in third place at 2.87 percent. “Some of our team members are doing low-carb, some are low-calorie and some are watching both,” she said. “I keep mine at a strict 1,200 calories per day with 20 net carbs. “We stick to our diet and exercise. No cheat days, no excuses,” Gilger said. Glenn “Big Dog” McClellan said that nipping that Mission Slimpossible feels at its sneakers is his hefty pack bounding and barking behind them. “I think the Big Dogs are going to become the lead dogs,” he predicted. The Big Dogs pounded the scales as fifth-heaviest team to start the Fitness Challenge, but they aim to leave much smaller paw prints seven weeks from now. Team support is the key, he said. “We have group text going on, all the team members encourage each other, we’re eating healthy and exercising.” In fact, McClellan was checking in from the gym. “I’m fired up now,” he said. The five-member teams in the 18th annual Fitness Challenge community weight loss competition that lose the greatest shares of their starting weights over eight weeks gain the largest helpings of prize money for the nonprofit service organizations of their choice. For the first time, the Fitness Challenge is divided into two divisions. If at least three members played on a team that finished in the top five in any of the last five years, they must compete as Dynamos. The rest are Go-Getters. There are seven Dynamo teams and 17 Go-Getters. For a $250 entry fee, each team will send at least $225 to the nonprofit service organization of its choice. The top five teams in each division earn more: First place, $775; second, $575; third, $400; fourth, $325; fifth, $300; sixth and lower, $225. The team with best single-week performance each week earns a bonus $10. The caveat is that all five members must weigh in at both ends of the week ä no laying back for a couple of weeks, then showing up with a three-week loss disguised as one. This week, the teams of the week are our two leaders, Mission Slimpossible for the Go-Getters and Just Weight for the Dynamos. Last week, we reported preliminary calculations that showed the 24 teams weighed initially at a combined weight of 27,203.5 pounds. Turns out, we were even bigger than that. In complete, official results, our combined starting weight is actually 27,309 pounds. That works out to an average weight of 227.6 pounds a player. Team weights range from God’s Busy Bees at 848.25 pounds to the Faithful Five at a combined 1,376.75 pounds. The Faithful Five are involved in a side bet with the Howland United Methodist Church. Between the two teams, the one that loses the least kicks in another $100 toward the lighter team’s charity. “First UM was instrumental in the founding of Howland UMC many years ago,” Faithful Five captain Larry Turner said. “Howland UM and First Church have shared many joint projects and ministries over the years. “Recently, Howland and First Church agreed to share a minister, Rev. Matt Darrin, an innocent bystander in this competition,” Turner said. “It is hoped that the side bet will draw the two congregations together in a friendly rivalry. So far, HUM team captain Ryan Slone has declined comment. After one week, the Faithful Five lead the side bet at 1.94 percent of starting weight lost (seventh place in the Go-Getters division) to 1.81 percent for the HUM Heavenly Losers (ninth place). Each week, we tip our napkins to one of the Fitness Challenge beneficiaries. This week, team captain Rudy Pekarovic tells who the Fructose Fighters chose. “We are sponsoring the Paramount youth group at Believers Christian Fellowship,” Pekarovic said. “The money will be put to good use. “It may enable someone to attend the summer camp who may otherwise not be able to attend. It could also just defray the cost necessary to have so many fun events throughout the year,” he said. How do the Fitness Challenge teams come up with those inventive names? This week, Gayle Wood, captain of God’s Busy Bees and also a member of Believers Christian Fellowship, shares theirs. “We just thought we would use the name of our ladies group,” Wood said. They stay busy. We’ll talk about their service group in the coming weeks. Standings charts with the full results of the first week of the Fitness Challenge for each team can be seen on Page B10 of today’s Tribune Chronicle.